Zero Tolerance Titanium Folding Knife collaborated with Dmitry Sinkenvich on the original ZT 0454 which was an award-winning folder but was in limited edition. Zero tolerance 0450 is quite similar to the initial 0454 regarding the high-performance function and streamlined form, but it’s a more compact form and readily available. 0450 updates all the favorite features of the initial limited tactical knife while maintaining its design, sleek look and strength. Zero Tolerance 0450 is coming up with a blade that is lightweight, sturdy and made from top -shelf materials. The blade is only 7.4-inches and weighs 3 ounces and can withstand just about any work. 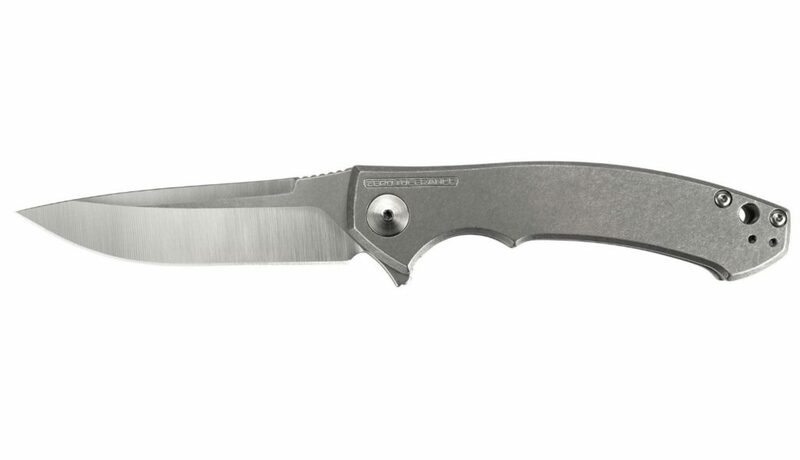 This American-made blade matches the perfect everyday carry flipper. This knife is wicked with getting everything right from the size to the design. Sinkenvich got his distinctive design aesthetic with this blade and fans can stop raving about how he is talented as an artist in the realm of function and beauty. Most users are drawn to the long, narrow blade as well as the slender profile. This 3.25-inch blade has a beautiful drop point blade with a prominent top swedge. Drop point design has been majorly used in the ZT- Sinkevich collaboration majorly because of the functionality it offers. Moreover, blade point blades are the most prolific blade designs on the market today because they are very useful in the day to day life. They are perfect for slicing as well as piercing cuts. Zero Tolerance 0450 sports a very nice high hollow grind that makes it nice and thin behind the edge. Since everybody is going CPM S35VN for the blade material, you don’t expect ZT not to jump on the bandwagon; after all, they are renowned for high-end production knives. Crucible Powder Metallurgy (“CPM”) is receiving the entire buzz in the knife production circles because it’s one of the most balanced steel in the market today. It boosts at scoring quite highly regarding stain resistance, ease of sharpening, ease of polishing as well as edge retention. Zero Tolerance 0450 treats S35VN steel to 59-60HRC to enhance its hardness. It also has a stonewash or satin finish which protects the blade from scratches. 0450 has the perfect balance between large and small enough to provide comfort. A good handle should provide a secure grip, and 0450 has excellent ergonomics thanks to its 4.1 inches which is a perfect size. The handle is made from stonewashed aerospace-grade titanium alloy that is resistant to corrosion, and it’s also very lightweight but doesn’t compromise on durability. The stone wash is just perfect since it hides most of the daily wear as well as keeping the little flipper looking brand new. The handle also has a reversible pocket clip as an additional feature to ensure that you have a deep carry that is easier to hold and conceal. This makes the knife to disappear in the pocket virtually. First, the opening of this folder is nothing but magical. Seriously, is this the fastest opening mechanism yet! Alright, the point is zero tolerance 0450 sinkevich made complete use of their patented KVT ball-bearing system because it’s pure perfection. The KVT ball-bearing pivot has a reliable, fast one-hand deployment. The detent has softened, and it’s as smooth as it can ever get. Clearly, this is the most fun feature of the knife that you just can’t stop gushing about it. The lockup feature is also worth writing home. ZT has put steel inserts between titanium lock bars and the hardened blade of the steel. The steel lock bar insert doubles up as an over-travel stop that prevents you from pushing the lock bar far enough to ruin the lockup. With such a sturdy frame lock bar, you have one less problem to worry about. This American-made blade has an overall length of 7.4 inches, weighs 2.9 ounces and comes with a lifetime warranty. It’s a top production knife that is made from high-quality materials which make 0450 very durable. The knife takes pride in having top-notch edge retention, ease of sharpening as well as resistance to wear and tear and it’s blade is razor sharp. It has an incredibly first and smooth opening mechanism and significant additional security features such as the lock bars. This knife has a distinctive design aesthetic which is a big selling point. It has excellent ergonomics: the handle feel is very comfortable. Some customers complain of the detent being a little bit stronger, but it smoothes after several flips. There are also complaints about it being smaller than expected, but the motivation of the collaboration was to create something smaller and sleeker away from the convention chunky ZT designs. Q: What type of pocket clip does the knife have, is it down carry or tip-up? A: It’s tip-up, left and right but also deep carry. Q: What are the knife’s dimensions? A: 6 inches X 2inches X 3 inches, and it weighs 4.8 ounces. Q: What opening mechanism does it use? A: It uses KVT ball-bearing opening system and a built-in flipper. Zero Tolerance Sinkevich 0450 is such an awesome knife receiving more props from the fact that it’s made in the USA and by an award-winning custom knife designer and a reputable brand in the tactical knife business. This lightweight and compact frame could never go unnoticed it’s buzzed about in the knife circles. Its classy design, size, functionality and the fact that you don’t need to break the bank to purchase amazes every knife enthusiast. This knife was an immediate hit right from the start, and it’s arguably the best seller for ZT thanks to all the greatness it oozes.